This floating ring is the size of a galaxy. In fact, it is a galaxy — or at least part of one: the photogenic Sombrero Galaxy, one of the largest galaxies in the nearby Virgo Cluster of Galaxies. The dark band of dust that obscures the mid-section of the Sombrero Galaxy in optical light actually glows brightly in infrared light. The featured image, digitally sharpened, shows the infrared glow, recently recorded by the orbiting Spitzer Space Telescope, superposed in false-color on an existing image taken by NASA’s Hubble Space Telescope in optical light. 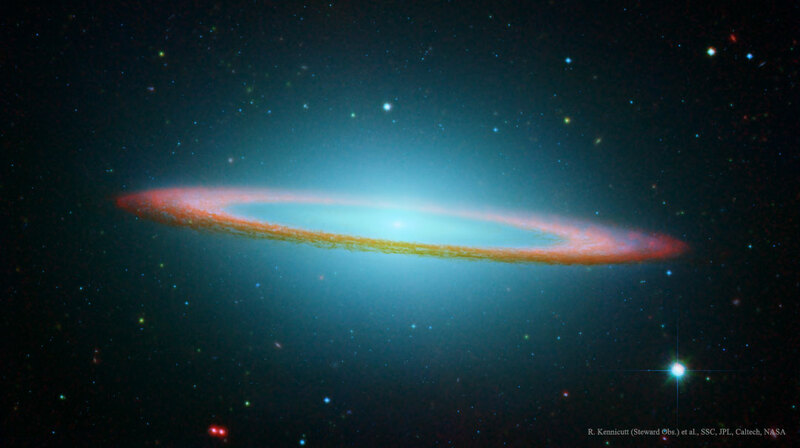 The Sombrero Galaxy, also known as M104, spans about 50,000 light years across and lies 28 million light years away. M104 can be seen with a small telescope in the direction of the constellation Virgo. Posted on Tuesday, 1 January 2019 by VGC	This entry was posted in ifttt-photograph and tagged IFTTT, NASA. Bookmark the permalink.